Original by Lieven Vanderberghe. Adapted to CVX by Argyris Zymnis, 12/4/2005. Modified by Michael Grant, 3/8/2006. Adapted to CVXPY, with cosmetic modifications, by Judson Wilson, 5/26/2014. # Computes the step response of a linear system. dim=4            # Grid is dimxdim (assume dim is even). n=(dim+1)**2     # Number of nodes. m=2*dim*(dim+1)  # Number of wires. beta = 0.5       # Capacitance per segment is twice beta times xi. alpha = 1        # Conductance per segment is alpha times xi. G0 = 1           # Source conductance. wmax = 1        # Upper bound on x. # Build capacitance and conductance matrices. #   version in MATLAB code. # First driver in the middle of row 1. # Reshape for ease of use. 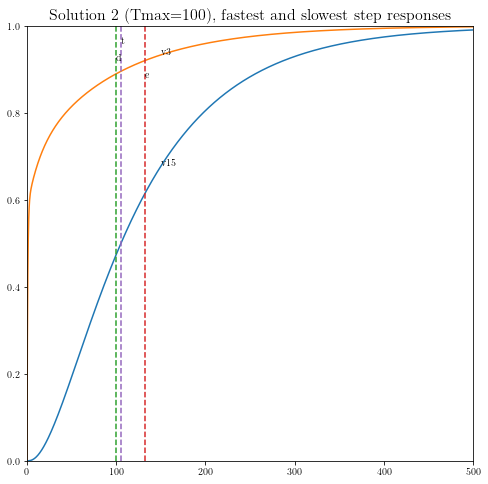 # Compute points the tradeoff curve, and the three sample points. # First pass, only gather minimal data from all cases. # and make plots (later). # Construct and solve the convex model. xt = cp.Variable(shape=(m+1)) # Element 1 of xt == 1 below. G = cp.Variable((n,n), symmetric=True)  # Symmetric constraint below. C = cp.Variable((n,n), symmetric=True)  # Symmetric constraint below. 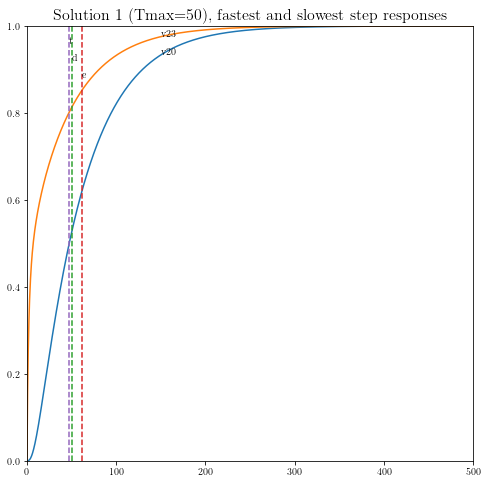 # Determine and plot the step responses. # Plot the tradeoff curve. # Label the specific cases.